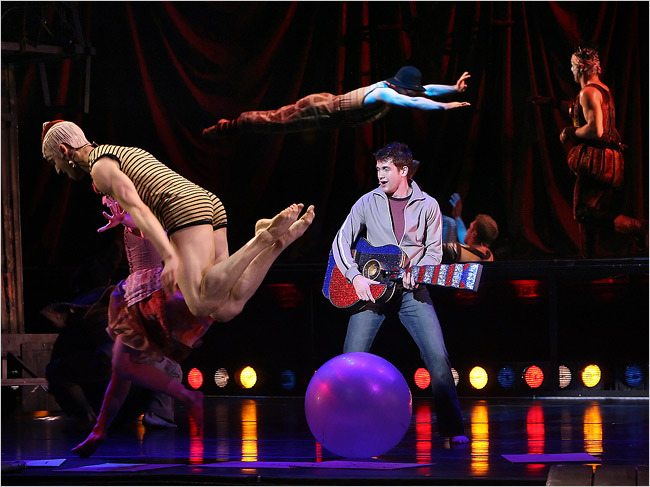 The Times They Are A-Changin', the Twyla Tharp-created musical featuring Bob Dylan's songs is "set within a low-rent traveling circus run by Capt. Arab (Sesma), whose wagon hasn't moved from its location in some time — though not by lack of effort from his ragtag band of clowns and performers," according to production notes. "One such performer is the animal trainer Cleo (Colella), a young woman exploited by Capt. Arab and loved by his son, Coyote (Arden). 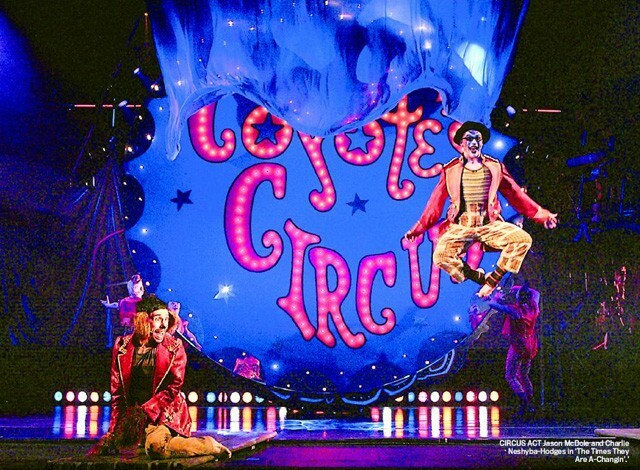 Coyote longs for a world outside the confines of the family business, and as the circus show plays out, he must decide whether to flee or stay, and if he does stay, how to inspire change within the troupe." Michael Arden, Jenn Colella and Thom Sesma currently star in the work. They are joined in the ensemble by Justin Bohon, Joshua Dean, Albert Guerzon, Charlie Hodges, Doug Kreeger, Marty Lawson, Tamara Levinson, Jason McDole, Jonathan Nosan, Joseph Putignano, Sean Stewart and Jackie Seiden. Demons dancing with devils in Robert Lepage's La Damnation de Faust at The Metropolitan Opera House in New York City. Joe Putignano as one of the crucified characters. Joe Putignano and other acrobats hung from harnesses to simulate a horse riding chase.